Whether you’re an interior decorator or a perfectionist in search of great home décor, you’ll want to use a laser level for wall hangings, to have those wall hangings straight. Fine art can’t be crooked, and neither can wall-mounted candle-holders or pottery and other items. So as a part of your home furnishings regimen, be sure to break out the laser level for wall hangings. Laser level—with a class II laser, and, ideal, a tripod. Measure the wall, both width and height. Measure the width and height of each piece of art, a fixture, etc., that you’ll hang. This will allow you to figure out the spacing for the pieces. When you have the positioning of the hangings, mark the spot with a pencil. Now we’re getting into the laser stage. Mount your laser level of choice on the tripod. If you don’t have a tripod, you can mount the level on the wall. Otherwise, you’ll have to be nearly primitive with something like an end table that you know to be flat and level, but we don’t recommend this. If the line laser or other sort of laser level you’ve bought didn’t come with a tripod, we’d recommend buying one. If you have the slightest chance of doing an outdoor job in the near future, go with the tripod. It’s necessary for just about anything outdoors, and that’s how it’ll pay for itself. Activate the self-leveling function on your laser level for wall hangings. It should take about half a minute to work. If you don’t have a self-leveling model, you will have to level it yourself. That won’t take a lot longer. Beam the beam at the wall. Your goal is to line the beam up with the pencil mark, thus replacing that mark with a scientifically-level line that goes across the wall. You will use either the controls on the level or your remote to move the beam up and down as necessary. Now carefully manually measure the distance between the top of the frame/hanging, and the hanging wire or other fixture. Make a mark on the wall that distance below the laser line. Measure the distance between the laser line and the new pencil line that represents the hanging point. Use a slide rule, tape measure, etc. Make any adjustments to the laser line as needed so that the distance between the two lines is the same as what has been measured. You’re now ready to break out the hammer, do some serious nailing, and hang that art. 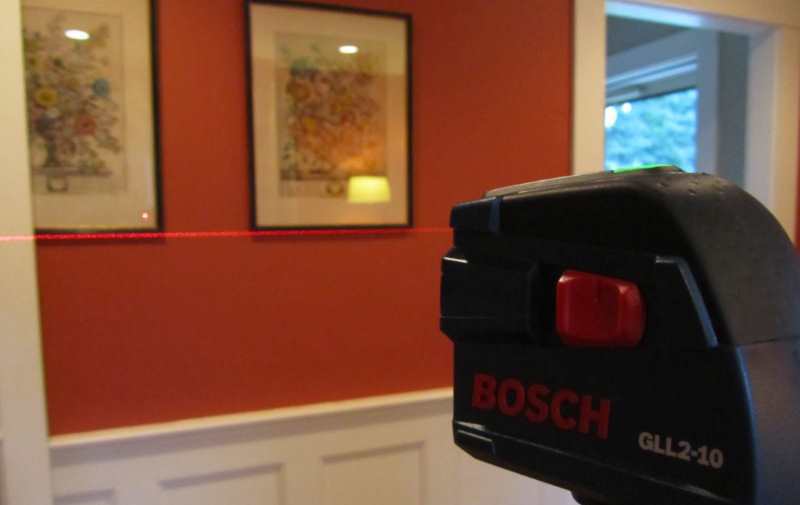 So, here’s the secret trick that shows the beauty of the laser level for wall hangings. Now that you have the hanging in place, you can still level it. Blast the green or red beam at it and simply put the top of the frame or other hanging in line with the laser line. You can’t go wrong this way. If you have a hanging with two different hanging wires, measure from the center of the hanging to the center of the hanging mechanisms. Similarly, if you run into a complication such as a wall that has a ledge or some disruption in its flat plane, you can deal with this as well. The main thing is to keep in mind the distance between the center of each frame, applying this to the directions above. Black and white photos in colored frames look great. Black and white actually gains quaintness and artistic cred by being offset by color. Split your photos to make them into a mini art gallery. Say you have a landscape-oriented photo of your family with a gorgeous forest backdrop. You can crop the photo into different jpegs, print these, and make them into separate photos. Your family will be in the center, with some of the forest in the adjacent photos. This is a great visual effect, as the three pictures will look like separate pictures that all work together. Use an inspiring quotation as the focal point of a gallery. You may be able to buy a hanging with the quotation on it, or buy a chalk board in an attractive shape and write the quotation. The objects or photos around it can illustrate or complement the quotation. 2-3-2. If you have several family photos or any assembly of several pictures in moderate frames, go with a 2-3-2 format, a row of 2, a row of 3, etc. This is a more interesting look that a simple block format, and when you’re going this route, the laser level will really come in handy. Clear frames can create a distinctive wall gallery. Align six or eight moderate photos in clear frames. Now, the photos themselves can be in magnetic frames or something similar. They should be smaller than the frame, so that you see the wall outside of the photos, and then the definition of the lines of the frames. Now, to take this one step farther, you can frame up the gallery on a wall with [stripes]. Say you have a lime green horizontal stripe about a foot from top to bottom on a white wall. You can place a top row of pictures on your white wall, the next row on the stripe, and then the bottom row on the white wall. As you can see, hanging pictures doesn’t have to be a basic and uninspiring chore. 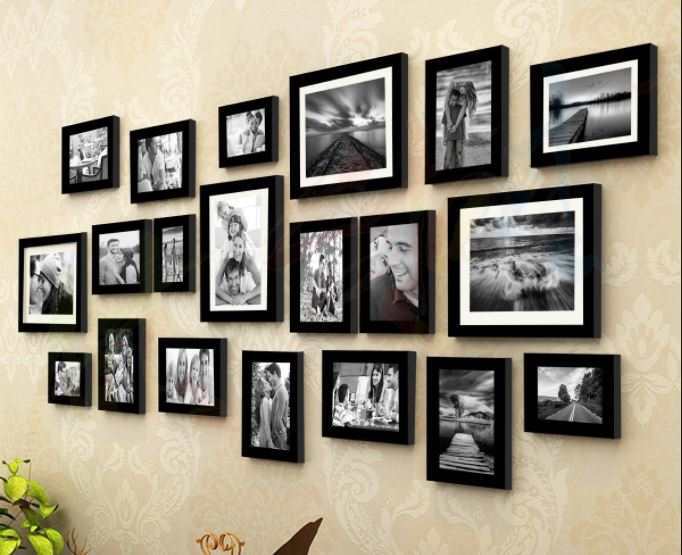 There are so many ways to showcase your photos, and also make your wall into a work of art. As mentioned earlier, you really don’t want to come up with a great concept and then hang one of the hangings off level. If you’re serious enough to make some great wall art, you won’t mind taking a moment to accept the help of a laser level for wall hangings.